I am not fussed by air travel. I am quite a small person, so I don’t take up much room. Like most, I don’t particularly like the middle seat or the window when travelling alone (there is nothing worse than climbing over sleeping strangers to zip to the loo) but I select my seat in advance in an attempt to prevent the inevitable. I take the abusive looks from tall, large men with a bout of nervousness as they squeeze past me to their middle seat; it is after all, not my fault you did not check in online. Having travelled on long haul flights from Australia many times I feel quite savvy when it comes to flying, assisted by my bag of goodies that aid the comfort of my trip; an extra pair of socks, a scarf (because I get incredibly cold) and a comfortable boyfriend to squirm and lean up against. Apparently, despite my so called travel bag of comfort and knowledge, I have been living under a rock of late and have missed the remarkable popularity of the neck pillow. Yes, the neck pillow – the banana shaped cut out pillow that too many people are proudly parading around their necks, not only wearing them on the plane but also walking them through airport terminals worldwide. I don’t quite understand the fascination but I have been told they are a game changer to air travel and that I must have one. Marketed largely for women, I see men and women alike donning an array of trendy pattered pillows around their necks, from the smart, witty and seriously unfunny to the dreary, drab and plain – they are simply everywhere. If the pillows are comfortable, aiding the horrendous discomforts of flying and encourage sleep then I am all for the investment. What I don’t understand is why on earth do owners of these pillows feel the need to wear them before boarding their flight? Are they asked to remove them whilst going through security checks? Is it likely they are to be considered a second piece of hand luggage? There are just so many questions. 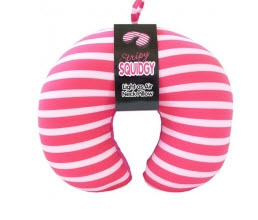 If I falter as a result of peer pressure in the lead up to my next trip (and the chances are high) I vouch to never display, in any way, that I am an owner of one of these said neck pillows… Never… Now I just need a bag big enough to hide one.